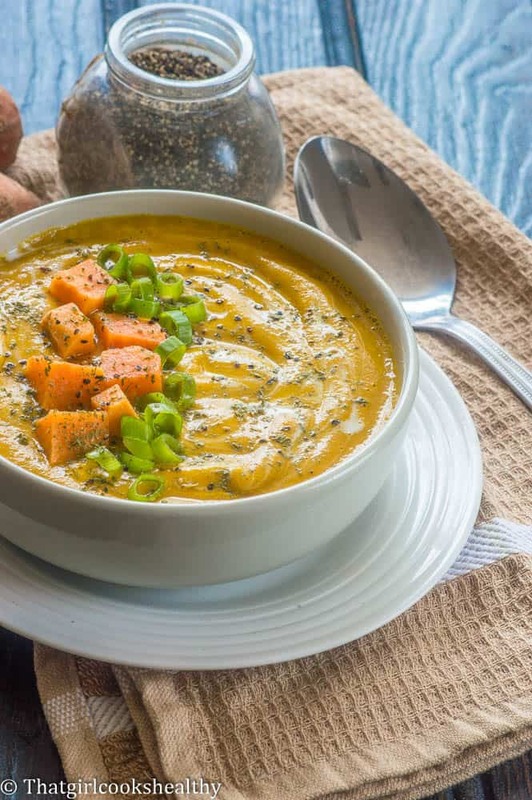 squash and sweet potato soup – This delicious duo of butternut squash and sweet potato makes for a tasty creamy vegan soup. Even though soup and comfort food tends to be associated more with the winter time. 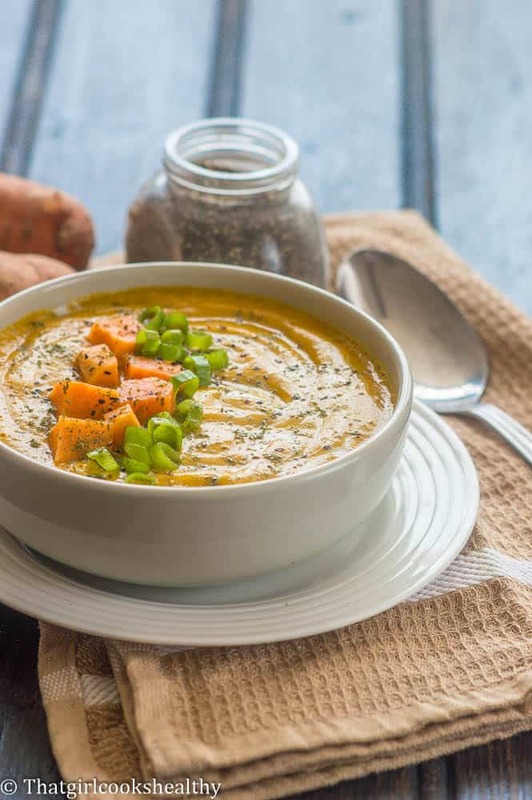 There’s nothing wrong with grabbing some butternut squash along with some sweet potatoes and putting the cogs into motion by making some squash and sweet potato soup – so warm, filling and healthy to boot! While many of us are still battling subzero temperatures, Charla still in a soup frenzy, cooking a selection of heart warming soups. Some have been hits other haven’t made it to the blog for obvious reasons. For instance the other day I failed misery at making some French onion soup (I’ve just given fellow bloggers a food brainwave). I tried doing a vegan version using veggie stock instead of beef with dollop of homemade vegan cheese in the centre of the soup bowl. I don’t know why but the taste wasn’t very appetising at all, it smelt amazing but tasted horrible. I ended up writing some troubleshooting notes for my second attempt. Don’t expect to see that disastrous soup make an appearance on the blog for now (work in progress). 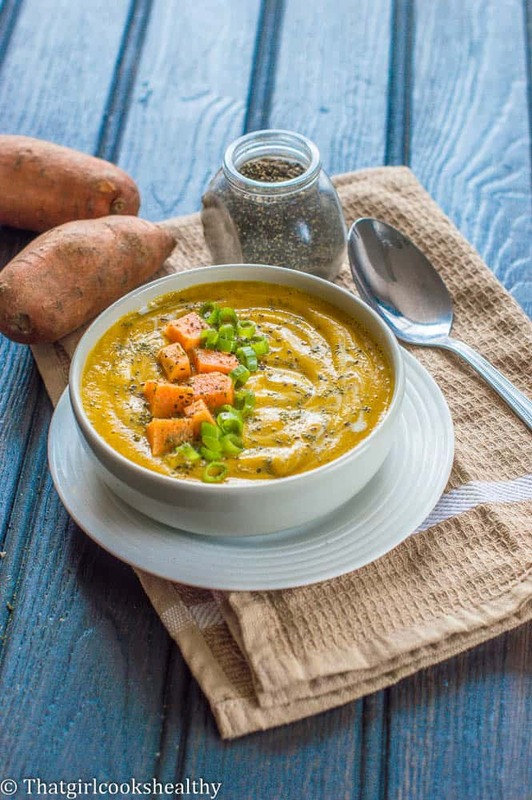 Anyway, the butternut sweet potato duo combination soup is going to fill you up with plenty of vitamins and minerals while hitting your tastebuds. The combination of healthy starch from both veggies just seem to work perfectly. Forget about waiting for pumpkin to be in season, butternut squash is where it’s at! 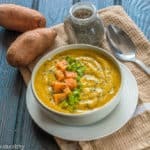 This soup is creamy, brimming with pungent flavours from roasting most of the ingredients needed. It may be more timely but roasting vegetables in a drizzle of coconut oil really enhances those wonderful flavours. Halfway through cooking time you will notice, the aroma in your kitchen – that’s your healthy hearty soup in the making! Once the veggies are fully roasted, it’s time to transfer them to a sauce pan with the stock. Simmer for 10 minutes with the added spices and pour into a blender to liquidise into a thick creamy soup. Start by placing the butternut squash, sweet potato, onion and garlic on a baking tray, lined and coated with oil, ready to roast. Place the butternut squash, sweet potato, garlic cloves and red onion on a baking tray lined with parchment paper and coat each veggie with the coconut oil. Roast the vegetables for roughly 25 minutes or until golden turn. Once golden, proceed with transferring everything from the oven into the saucepan. Make sure to scoop the roasted sweet potato from the skin and discard. Add the stock, and stir in the black pepper, pink salt, nutmeg, thyme, coconut milk, chilli and ground coriander to the pan on medium heat. Simmer for 10-15 minutes, stirring frequently. The squash and sweet potatoes may begin to breakdown, the remainder can be liquised in the blender. After 15 minutes, carefully pour the hot contents in a high powered blender and blend into a smooth consistency. All things bright and beautiful! look amazing.